A collection of essays to savor! Alexander Chee explores issues of identity, family, art, gardens, life as a writer, and so much more. He shares his discoveries about himself and our culture in these thoughtful - and thought-provoking - essays. His perspectives on the creative process are intensely personal and at the same time universal. I found myself backtracking to re-read passages for the combination of simple beauty of the language he used to express the truth he revealed. ALEXANDER CHEE is the best-selling author of the novels The Queen of the Night and Edinburgh, and the essay collection How to Write an Autobiographical Novel. He is a contributing editor at the New Republic, and an editor at large at Virginia Quarterly Review. His work has appeared in The Best American Essays 2016, the New York Times Magazine, the New York Times Book Review, the New Yorker, T Magazine, Slate, Vulture, among others. He is winner of a 2003 Whiting Award, a 2004 NEA Fellowship in prose and a 2010 MCCA Fellowship, and residency fellowships from the MacDowell Colony, the VCCA, Civitella Ranieri and Amtrak. He is an associate professor of English at Dartmouth College. "Alexander Chee is one of the best living writers of today. If he’s not already a household name, he needs to be…powerful, powerful essays with powerful, powerful words…"
"If writing, too, is a form of drag for Chee, it is also an act of mystic invocation and transference...Chee leavens his heaviest topics—the decimation of the gay community in the late 1980s and early ’90s, the repressed memory of sexual abuse that inspired Edinburgh—with charming episodes like his stint as a waiter at William and Pat Buckley’s Park Avenue maisonette, a job that prompted a crisis of conscience given Buckley’s infamous proposal to brand AIDS patients on their wrists and buttocks...Even at his most mystical, Chee is generous; these pieces are personal, never pedagogical. They bespeak an unguarded sincerity and curiosity. Chee is refreshingly open about his sometimes liberating, sometimes claustrophobic sense of exceptionality...He reminds us that whomever a writer pictures as his audience, he is also writing into absence, standing in testimony for the sake of the dead. Like most of the essays here, 'After Peter' pulses with urgency, one piece from a life in restless motion. It is not necessary to agree that How to Write an Autobiographical Novel is itself a kind of novel in order to appreciate that Chee has written a moving and personal tribute to impermanence, a wise and transgressive meditation on a life lived both because of and in spite of America, a place where, he writes, you are allowed to speak the truth as long as nothing changes.'" "Two-thirds of the way through Alexander Chee's How to Write an Autobiographical Novel, I abandoned my sharpened reviewer's pencil in favor of luxuriating in the words. Chee's writing has a mesmerizing quality; his sentences are rife with profound truths without lapsing into the didactic...Chee is a very special artist; his writing is lyrical and accessible, whimsical and sad, often all at the same time. No doubt he is an inspiring writing teacher as well. His views on writing reflect his own, thoughtfully examined life." "As Chee’s gaze turns inward, he beckons readers to experience his private moments with such clarity and honesty that we’re immediately brought into his consciousness. At the same time, he asks us to contemplate the largest questions about identity, sexuality, family, art and war...[A] trailblazing collection...By the end of this moving collection, we learn through Chee’s experiences that to be a writer is to continuously reconsider the self, to find what drives you even in moments of despair." "Alexander Chee’s marvel of a collection opens with the sting of clarity...The 16 essays that knit together his profound and resonant collection are a nimble study in radical self-invention...The revelations that follow crackle with the same glowing, essential truths." "Chee’s insights about writing, love and activism are hard-won, honest and incredibly wise." "The latest brilliant fiction writer to publish a new essay collection this year...Alexander Chee proves why he’s a master of the form. How to Write an Autobiographical Novel meditates on how art shapes who we are, unpacking its author’s own coming-of-age as a gay Korean man to craft persuasive, engrossing arguments." "As profound as they are beautiful, Chee's essays impart wisdom from a life fully lived, and speak to what it means to be a writer and reader in contemporary times." "A searing examination of the costs of writing...achingly vulnerable." "A deeply probing exploration of being a writer, an activist, gay, and half-Korean all at once. Hewing to his own advice as a teacher, he places no limits on the questions he asks of himself and of the reader, which feel at once overwhelmingly intimate but strikingly universal...How to Write an Autobiographical Novel is filled with the uncertainty that comes with feeling your sense of self forming. It is, at once, a memoir and a survival guide for being your most authentic self." "A knowing and luminous self-portrait." "Chee’s essays convey the effect of new forms being invented before your eyes. His book is a fragmented portrait of the young artist donning and shedding various masks. Chee makes use of conventional vehicles — the memoir, the list, the litany of didactic aphorisms — to arrive at moral and aesthetic discoveries that you sense he didn’t see coming himself." "Part memoir, part writing how-to, Alexander Chee’s essay collection, How To Write An Autobiographical Novel, proves that the two-time novelist ranks not only as one of our most important writers but also among our greatest souls...These essays offer much more than an inspirational template to becoming an artist, but propose a blueprint for living a beautiful life." "Alexander Chee has been a beloved writing teacher and generous supporter of fellow authors for quite a while. His first collection of nonfiction is a lovely reminder that there is indeed an art to the personal essay, and he is a master artist." "In place of the imperative structure characteristic of so many craft books that cheerfully promise a way forward, that evince a comfortable universe of coherent rules and achievable outcomes, Chee offers instead the roundabout and the recursive, the indirect and stubbornly nonlinear. His essays are an invitation not to review the rules of writing, but to trace a unique pathway into knowledge and being in and through writing...Chee is an adroit observer...There’s a sumptuousness in Chee’s writing, a confident acumen that forgoes high drama in favor of amicable ease." "Unique and powerful, insistently itself." "Chee proves masterful when he turns to descriptions of real life...Rarely does a book of essays come along so affecting, so brave and bluntly honest, and so raw and poetic. I quit underlining my favorite aphoristic lines by the time I reached that third essay: it was useless to try to pick individual diamonds from a whole pile of them." "When you dive into Alexander Chee’s collection of essays, expect to frequently pause and soak up his gorgeous writing. To read Chee is to find yourself submerged in whatever topic—9/11, Tarot reading, his father’s death, the AIDS crisis, rose gardening—he’s discussing until you’re living in between the pages. Chee succeeds in weaving an intimacy born of honesty, bluntly writing about, well, the writing process and the stories we tell ourselves. We knew he was a talented novelist (check out Edinburgh and The Queen of the Night), but with How to Write an Autobiographical Novel, Chee cements himself as a master essayist as well." "There is not a book out this year, or for many years in recent memory, that did what Alexander Chee did...With absolutely gorgeous prose, Chee strikes the perfect balance of teaching you a lesson and equipping you with wisdom, without pandering or sensationalizing. This man is the mentor you never had, and continues to be one of the best writers in the game." "If you’re the kind of writer who will never get an MFA but wants to know more about how writers are trained and how they think, there’s so much to consider and it’s provided in the kind of prose that will thrill you and make you deeply jealous." "I love [Chee's] novels, but he is also wicked smart, and has many insightful, thoughtful things to say about the world." 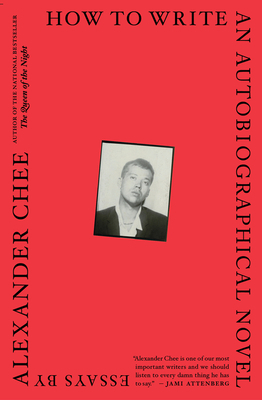 "In his first collection of nonfiction essays, novelist Alexander Chee immortalizes himself through his art and literature...Enlightening, revealing the true impact of the arts." "Engrossing, smart, insightful, intimate, moving, responsibly adventurous, somewhat meditative, even occasionally luscious." "A master class in memoir, writing, and life." "The central essay “The Autobiography of My Novel” is almost a pure lesson in craft, and a deliciously generous one...offer[s] the reader the unique gift of being both affirming of the writing life, no matter how winding or torturous or incomprehensible it might be, and affirming of the simple fact that we are alive in the world at all." "Chee has lived a disarmingly full life. His essays veer between straight memoir and craft and writing-life rumination, a perfect mix. I’ve been browsing through each installment one by one, out of order, for months now —approaching the pieces about novel-writing with a mix of rabid hunger for wisdom and fear that they will reveal my own shortcomings as a writer. I shouldn’t be scared: Chee’s thoughtful, self-aware candor pervades each piece, all of which are threaded together by a deep, but never grandiose, faith in storytelling." "Bears all the hallmarks of the writer's intelligence, curiosity and precision with language...entertaining and illuminating...Alexander Chee demonstrates how to transform life into art in this sharp and thoughtful collection of essays." "Poetic and utterly moving, this stunning book attempts to get at the heart of how we not only create but defend out identities, to ourselves and to the world". "Compelling...Gorgeous, dense, provocative...Chee delivers 16 essays of varying weights and lengths, mostly in the first person and largely in chronological order. The effect is both profound and incremental, of stories that stand alone and work together to unveil a life...Chee’s variegated memoir alternates between coming-of-age stories and self-scrutiny, a writer’s lessons and appraisal of his own work, each mapping parts of a larger identity. The book is operatic in its range, reflecting the author’s life as an outsider not only to the culture, but at times, to his family and himself. The resulting narrative makes for some powerful, lyrical prose." "Alexander Chee is a writer whose work you should know, and you’re lucky because his new book is the perfect introduction...Simply gorgeous...There are few writers whose collections of nonfiction can induce the kind of collective awe and excitement that Chee seems to cause...Chee isn’t just brilliant, he’s an original...To a generation of queer writers, Chee is a beacon, measuring stick, and fairy godmother. It would be simplistic to say that Chee’s work provided me with a working model of how one could go about life as a queer artist of color, but it would also be the truth, or part of the truth...In his excellent first essay collection seems to have all the answers I’ve been craving." "Pretty much universally beloved...Crammed with wit and elegance and feeling and hard, practical lessons for being a better, smarter, more conscientious—and straight up more conscious—writer." "Don't be misled by its title: How to Write an Autobiographical Novel by Alexander Chee will teach you anything but. That being said, reading the work of a master like Chee cannot help but force you to improve your own writing, if that's your thing. He won't tell you how to write, but gosh darn it he will certainly show you. Whether he's describing the sound of mangoes (or bullets) hitting windshields outside while he tried to sleep during his summer spent living in Mexico as a teenage boy, or reminiscing about working for some of the wealthiest people in America in his late twenties, Chee keeps the reader engaged in his essays as if they were works of elaborate and suspenseful fiction. But these aren't simply stories of a man's life. These essays offer wisdom, hope, and beauty in the most unexpected places. They are tiny works of art short enough to devour in one sitting yet long enough to savor over a three day weekend. There are countless lines in here that are just begging to be underlined, circled, or highlighted. Indulge yourself. Good books are meant to be ravaged. If you're new to essay collections, I suggest you start here. Chee knows how to teach all of us things without ever seeming like he isn't one of us. His voice is present in each piece in this delicate collection in a different and special way. These stand alone beautifully and need no context to be appreciated, but read together as a whole they are an intricately braided tapestry of stories, concepts, and ideas, the depth of which cannot be ignored." "Readers will delight in this memoir-in-essays...In these pieces, he evolves from a plucky 15-year-old beguiling the locals of Mexico into believing he’s one of them after his swift acquisition of Spanish, to one of America’s premiere literary voices fighting against politics that threaten his deepest convictions...This manifesto’s universal truths will speak to readers from all walks of life." "As a reader, I've been moving through this collection of essays about life and writing with uncharacteristic slowness, relishing every private moment Chee that invites us into. As a teacher of writing, I've been giving copies of this collection to my students and loving the thoughtful conversations that result about writing, memory, and growing into oneself." "I could read [Alex's] sentences about almost anything." "Alex Chee explores the realm of the real with extraordinarily beautiful essays. Being real here is an ambition, a haunting, an impossibility, and an illusion. What passes for real, his essays suggest, becomes real, just as life becomes art and art, pursued this fully, becomes a life." "These essays feel like a life's wisdom—its hurts, joys and redemptions—salvaged from a great fire. After reading these myriad-minded and compassion-filled essays from Alexander Chee, I feel in possession of a map of secrets and second chances; I feel I am holding an inheritance whose gifts have only been partially revealed to me, inexhuastible as they are. But these essays are more than maps; for me, as a younger writer, they are the very ground. They are the earth made solid enough so that I might stand here, made rich enough so that I might plant here, and, like Chee's devastating rose garden in "Rosary," thrive here. This book makes me feel possible." "I'm astonished by the wisdom of these essays, and how beautiful they are. A riveting account of activism and artistry, as well as a profound exploration of the intersections of identities and experiences that build up this novelist's composite eye. Alexander Chee is brilliant and brave in equal measure, and has written an essential book about how to survive as an artist in America today." "How to Write an Autobiographical Novel is a rare hybrid of a book: an act of poetry, a gift of entertainment, and a primer for life. Alexander Chee is one of our most important writers and we should listen to every damn thing he has to say." "The language is beautiful, the subject matter variegated and the insight profound... This is how you write an autobiographical novel." "How to Write an Autobiographical Novel is a formative collection, sure to cement Chee as not only a preeminent novelist but a powerful essayist as well. In his work, Chee makes the writing life look both envious and easy. For anyone who’s ever tried it, that’s no small task." "Chee’s advice for the writer spans the pragmatic and the lyrical...I might have been a better fiction writer had I read Chee’s essays. I might have gained a more sophisticated understanding of how writing fiction emerges from the self yet, of necessity–and if it is to interest anyone beside yourself–take you outside yourself as well." "A heavy subject matter to be sure, but Chee’s ability to get to the heart of the story and present it in an imminently accessible, humanistic manner helps cut through the labels to present a group of people struggling to exist in a country that perhaps ironically touts itself as the home of the free and the land of the brave...Chee’s prose is so vivid and yet utilitarian...you feel as though you are right there in whatever moment it is he is describing...His ability to draw the reader into a scene is like few others...At once both literary and accessibly conversational...Chee’s is a rare voice in terms of experience and the ability to clearly convey his worldview, one increasingly relevant now...Very much of the moment...With How to Write an Autobiographical Novel, Alexander Chee shows himself to be a profoundly important voice in these confoundingly divisive times." "An absolute gift of a book for writers everywhere. Every single essay is a pearl." "A collection of 16 arresting essays that address the manifold ways in which this smart-funny, gay Korean American novelist and cultural commentator has come to understand the extent to which his life, art and culture intersect." "Quotable, pristine essays...Hand to readers searching for something to follow 2017’s incredible parade of writers’ memoirs, including Roxane Gay’s Hunger and Amy Tan’s Where the Past Begins." "In Chee’s hands, varied subjects, however disparate they may seem, coalesce...A duller, less evocative title along the lines of How I Became a Writer might have been more accurate, but that would have failed to convey Chee’s marvelously oblique style as an essayist—his capacity to inform and educate readers while they’re too enraptured to notice." "Precise and candid...What truly unifies these pieces, though, is the author’s consistent care with words and open-hearted tone; having been through emotional and artistic wars, he’s produced a guidebook to help others survive them too. Deserving of a place among other modern classic writers’ memoirs like Stephen King’s On Writing and Chee’s mentor Annie Dillard’s The Writing Life."